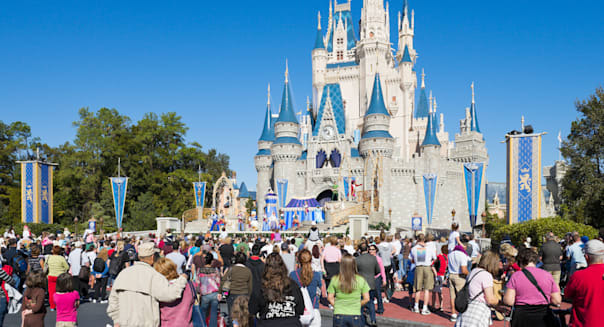 Disney (DIS) unplugged the FastPass machines at its Florida theme parks last month. Now, instead of guests stepping up to machines at every attraction that spit out return times for priority boarding, the family entertainment giant is installing centralized kiosks that can offer reservations for as many as three rides and attractions at a time. This may not sound so bad at first. Despite having to line up to peck at a touchscreen for the new FastPass+ platform, most would agree that having centralized hubs to square away priority access for more than one ride at a time is an upgrade. It will be -- in time. Right now, Disney is going through an awkward tech transition phase that in its current incarnation rewards guests staying at Disney-owned resorts at the expense of everybody else. It won't last, but it will be uncomfortable until advance access to the new FastPass+ isn't just limited to its overnight patrons. Guests staying at one of the many Disney-owned resorts in Disney World receive perks that visitors staying elsewhere don't get. They have access to the park's complimentary shuttle bus service from the resorts to the theme parks, saving them what has ballooned up to $15 a car for parking. They also get what Disney calls Extra Magic Hours -- admission into selected theme parks either an hour before it opens or a couple of hours after it closes. Disney hasn't taken any kind of heat for offering those benefits. Providing transportation within the resort is a no-brainer, keeping guests from renting cars and straying to rival attractions. It's also not as if the park would be open earlier or later if it wasn't for the incremental Extra Magic Hours. However, for now, only those staying at a Disney World resort can use FastPass+ to book priority queue access days in advance. Resort guests can book ride and attraction reservations as long as 60 days in advance, and change them after that through Disney's official theme park app. Day guests and even annual pass holders aren't so lucky. They have to queue up once they get to the park after resort guests have chosen the three rides or attractions that they want expedited access to that day. Limiting everyone to just three FastPasses per day may improve availability, but for now it's resulting in slowing down the experience of those not staying at a Disney hotel by having them queue up to claim what the resort guests left behind. Hotel guests have been getting MyMagic+ wristbands for several months. The RFID bracelets can be used at park turnstiles and ride entrances to store admission information, offering more customized experiences to the gated attractions. However, the FastPass machines were always there spewing out ride reservations for all guests until Animal Kingdom switched entirely to FastPass+ during the last week of 2013. The other three parks followed in late January. %VIRTUAL-article-sponsoredlinks%Annual pass holders and other day guests could have enviously eyed the the colorful bracelets, but they didn't necessarily feel as if they weren't first class customers. That may be hard to dismiss now that the FastPass machines are gone with only resort guests making ride reservations before they arrive at the park. The gap between those staying at the resort hotels and those spending the night elsewhere has never been this wide. It won't last. Disney sent an email to pass holders indicating that they will eventually receive access to FastPass+ plus before they arrive at the park. Other guests will likely qualify eventually as well. Disney can always argue that it's not the only theme park operator giving resort guests enhanced access. Comcast's (CMCSK) Universal Orlando offers early admission and perpetual access to its expedited lines. However, day guests can simply purchase Express Pass tickets to get up to speed. Even regional players get in on the fun. Cedar Fair (FUN) allows guests staying at its Cedar Point peninsula properties to ride a couple of its most popular roller coasters an hour before the public is let through the turnstiles. However, Disney's migration to the new FastPass+ platform is going to confuse and potentially upset many of its visitors until the playing field is level. Motley Fool contributor Rick Munarriz owns shares of Walt Disney. The Motley Fool recommends Walt Disney. The Motley Fool owns shares of Walt Disney. I always assumed I needed a cabin in the mountains, an ax or other weaponry draped over my shoulder, and a full beard in order to snowshoe. But as it happens, snowshoeing can be done by pretty much anyone, fairly cheaply. Find a local outdoor equipment rental supplier and snag yourself a pair of snowshoes for under $10. Sledding has two perks that make it a perfect winter activity: 1. It's free (assuming you have a sled or a friend's you can borrow). 2. You're outside, but you're not cold, because all it takes is a couple of times climbing back up your favorite sledding hill, and you're breaking a sweat. And did you know that sledding is the cutest photo op for a family ever? Oops, that's three things. There's no better way to enjoy winter than from the inside of your toasty warm car. And no December is complete without a self-guided tour of the best local Christmas lights. This list compiles some favorite spots across the country, but you can also Google the best displays in your area. And (added bonus), your children are strapped in for this activity, which should keep things simple and (relatively) drama-free. Thanks to Pinterest, the DIY bug is more contagious than ever -- especially during the winter. If you're looking for a free way to unleash your inner Martha (or Marty, for you guys out there) Stewart, try out a free DIY workshop from home-improvement stores like The Home Depot or craft stores like Michaels. Other retailers are also getting in on the action, such as Apple, which hosted hour-long coding classes for children at their stores this week. Get the thrill of the outdoors without the winter weather in the pleasant confines of an indoor rock gym. For the price of a movie and popcorn, you can get a day pass, learn how to belay friends and family safely, and scale to your heart's (and ripped forearms') content. When winter gives you frozen lemons, make piping-hot lemonade -- and then swim in it. (That's the expression, right?) According to the National Geophysical Data Center, there are over 1,661 natural hot springs in the United States. However, most are out West. If you happen to live east of the Rockies, it's high time to make friends with a hot-tub owner. Leave the fancy clubs and goofy-looking pants at home; this is poor man's golf. But don't let that fool you. It's a great game for beginners and Tiger Woods frisbee-ers alike. With public courses across the country and greens fees that are typically 100 percent cheaper than regular golf, you might completely forget about those clubs in your trunk come spring. Going to a movie for a dollar might sound like something your grandparents did in simpler times, but believe it or not, you can still catch recent releases in theaters for just a buck or two. They're getting harder to find, but do yourself (and your budget) a favor by finding a local dollar theater this winter for some quality entertainment.